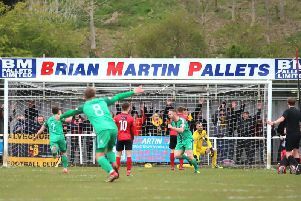 The Poppies take on play-off contenders Alvechurch at Latimer Park knowing that a victory will see them crowned champions after they set up the opportunity with a 1-0 win at Leiston last weekend, courtesy of a last-gasp goal from Aaron O’Connor. Late wins and moments of individual brilliance have played a key part in Kettering’s charge for the title since the turn of the year. And Law is hoping for more tomorrow (Saturday), although he knows his team can’t afford to take Alvechurch lightly. They sit in the final play-off position and are six points clear of the chasing pack after they beat Leiston 2-1 on Tuesday night. And the Poppies boss said: “They are there for a reason, it’s not luck. They have earned that position because they have been consistent and they are a very dangerous team. “We have got to go about our business and not get mixed up with the hype. “We must go and get the job done. We would love to put on a show for what will be a bumper crowd and we would obviously like to get over the line. “But Alvechurch need the points as well. Whether they come here to go for all three or sit in for one, I don’t know. 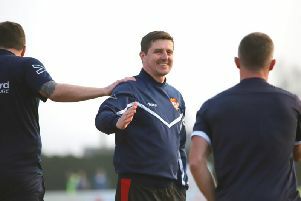 “But one thing I do know is that we have got players who can come up with something when we need it and that was shown again last weekend. “We have got different individuals who have made a difference at different times and that is one of the reasons why we have been so consistent. “And we have shown an ability to score late goals and those have been the difference between this being a three-horse race for the title and not. The Poppies have just one injury concern ahead of the clash with Marcus Kelly being assessed after he missed the win at Leiston with a thigh problem.